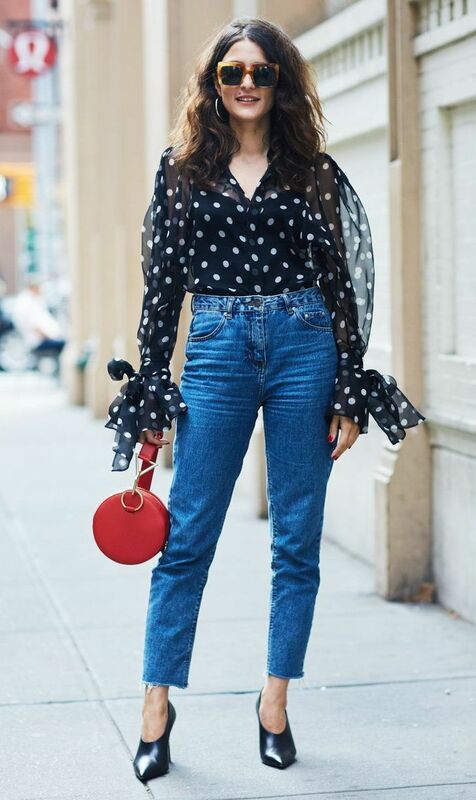 There is one “BUT”, how to make polka dots look great with other clothes. Indeed, this can be quite tricky and difficult. Sure, you can use solid color garments, but we want to make things look fresh and modern, right? I’ve got some suggestions and tips for you. Read on to find out more. First of all, is a classic look that consists of basics and neutral color garments. 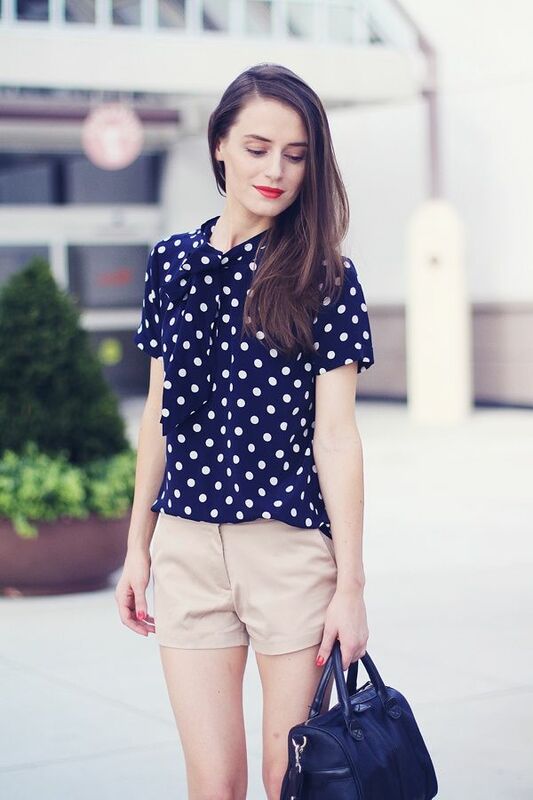 This is a preppy way to make your polka dots look sweet and ladylike. For instance, you can pull off blue blouse in white polka dots and tuck it inside cream-beige tailored shorts, or keep it sophisticated by teaming white shirt in black polka dots with a charcoal knife-pleated midi skirt. Sure, it doesn’t look too bold or bright, but you can wear it anywhere you want. If it’s quite chilly outside, then you can try on polka dot dress and wear it underneath your favorite coat or jacket. For instance, you might like to try on green retro style dress in white polka dots and style it with washed blue denim jacket, or keep things glamour with a midi white dress in black polka dots and furry cream-beige coat. In other words, this is a perfect style for those who think their polka dresses look too much statement. If you are one of those gals who wants to keep things bright and chic, then I recommend to try on polka dots on polka dots print. This double print looks really awesome. For instance, you can go for polka dot bra-top and pair it with high-rise knee-length polka dot skirt. I highly recommend to mix and match different polka dot sizes and colors. Believe me, this combo gonna make you look youthful, fun and chic. Another great pairing is polka dots and stripes. This combo can be quite tricky to be done, but the secret lies in: big stripes and small dots, or vice versa. In other words, you have to balance your prints to make them look ladylike and sweet on you. Once you achieve this look, I recommend to keep your jewelry and accessories to a minimum. 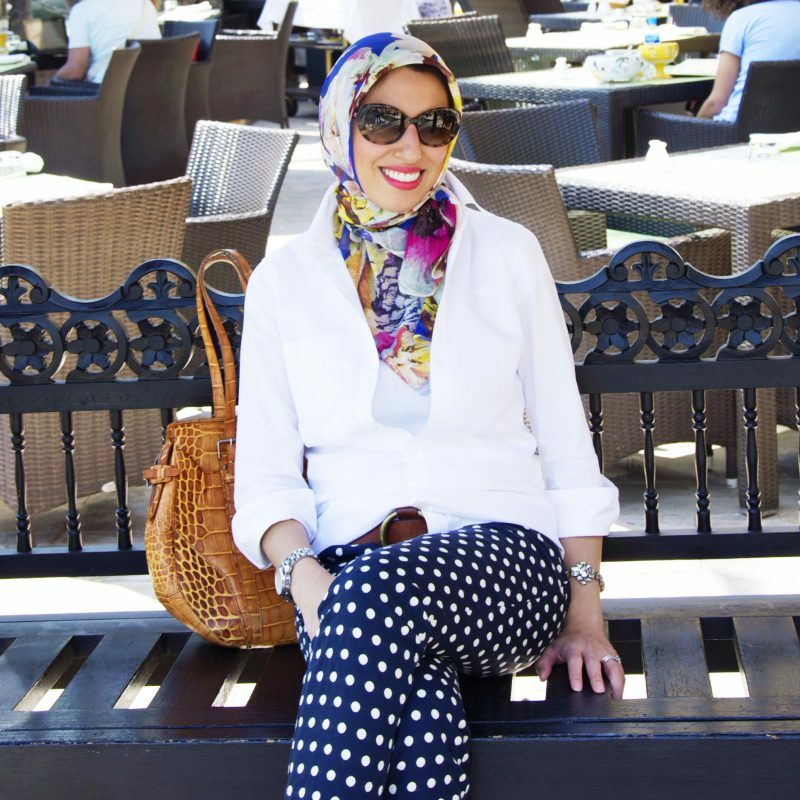 I love to see ladies who appear on the streets wearing crispy white blazers worn atop white polka dot black shirts teamed with black-and-white vertical striped trousers. The last but not least, polka dots look gorgeous teamed with floral print. Sure, it’s fun and loud, but so feminine and sweet looking.